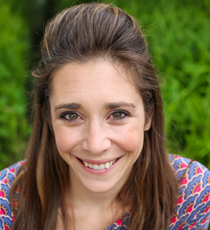 Michela Chiappa is a Welsh/Italian Cook, Author, Entrepreneur and Presenter. Michela came to our screens fronting Channel 4’s Simply Italian showing viewers the family secrets of how to make fresh pasta, starting with the simple recipes of how to make the dough and finishing the series with more complex dishes such as Uovo in Raviolo (a poached egg inside a fresh pasta parcel). The show was a great success and converted people’s opinions on the simplicity of fresh pasta. Alongside the TV series, Michela and her sisters launched the cookbook Simply Italian. The book is full of their family recipes and traditional recipes handed down the generations from the Emilia Romagna region in Italy. Growing up in the Welsh Valleys to Italian parents, Italian traditions are an important way of life and cooking is at the heart of Michela and her sisters’ upbringing. Italian being their first language, the Chiappa sisters were involved in the kitchen as soon as they could walk and talk. There might have been some cracked eggshells in the mix or flour on the ceilings, but in the Chiappa household knowing how to cook is as important as an education. Now Michela has learnt to juggle her career and having a family whilst maintaining the values and traditions of the Italian household. Passionate about the importance of fresh, wholesome, home cooking, Michela likes to demonstrate how anyone can juggle fresh home-made food with a busy working and parenting life. In 2016 Michela and Emi Chiappa released Baby at the Table a revolutionary guide to weaning and feeding the family with one meal. Online The Chiappa’s You Tube channel sees the sisters delivering simple and accessible recipes for all the family including quick and easy baby food recipes. Michela has recently been reviewed as one of the top ‘Mummy Bloggers’ by The Guardian, Channel Mum and others. The Chiappa’s enjoy working creatively with a range of brands and hosting live events and at food festivals.